1. Trouble for Toshiba and Takata: Shares in two struggling Japanese firms suffered heavy losses based on local media reports that intensified investors' fears. Takata (TKTDY) shares plunged 17% after the Nikkei newspaper reported that companies bidding to provide financial support to the embattled airbag maker want to take the restructuring process through the courts. Takata said in a statement that no decisions have been taken yet and it had nothing to announce at this stage. Meanwhile, Toshiba (TOSYY) shares plummeted 16% on reports that losses from its nuclear construction business could be even bigger than the "several billion U.S. dollars" it warned of last month. Toshiba said in a statement that the figures are still being calculated and that it will announce the impact once it's clear. 2. ECB announcement: The European Central Bank is putting out its monetary policy statement at 7:45 a.m. ET. It isn't expected to make any dramatic policy changes. But investors will be watching ECB chief Mario Draghi during his 8:30 a.m. press conference for clues about whether the central bank thinks its bond-buying stimulus program is working. 3. Watching Netflix: Investors are feeling hot about the "Netflix and chill" trend. Shares in Netflix (NFLX) are surging by about 8% premarket after the company reported a massive surge in subscriber growth. The company added 7 million members globally in the final quarter of 2016, handily beating its earlier forecast for 5.2 million new subscribers. The video streaming service now has 93.8 million members. 4. Trump's Treasury man: Steven Mnuchin's confirmation hearing to be the next Treasury secretary is almost certainly going to be contentious. The former Goldman Sachs banker and producer of movies like "Suicide Squad" was also the CEO of OneWest Bank, which has been accused of lending discrimination and unfair foreclosure practices. In addition to questions about his personal record, Mnuchin will also get grilled about key fiscal policies that the new Trump administration is likely to introduce. 5. Earnings: Earnings season rolls on after the closing bell when a pair of companies in the Dow Jones industrial average report quarterly results: IBM (IBM) and American Express (AXP). 6. Global market overview: International stock markets are looking pretty tame right now. 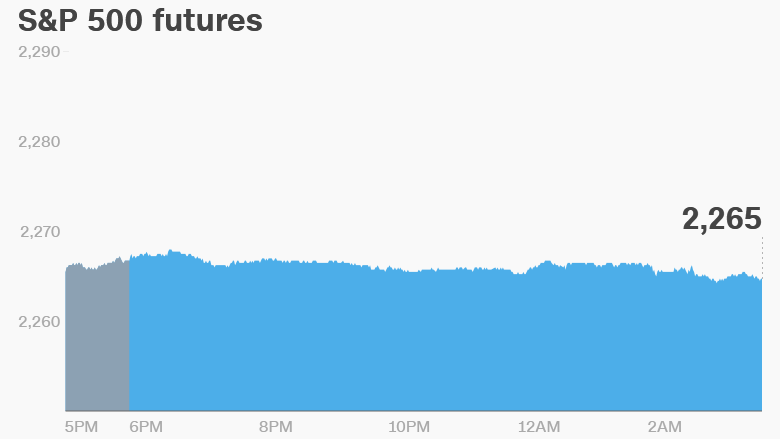 U.S. stock futures are edging down a bit. European markets are mixed in early trading. Asian markets ended the day with some minor gains and losses. This follows a rather mellow trading day on Wednesday. The Dow Jones industrial average declined 0.1%, while the S&P 500 and Nasdaq rose 0.2% and 0.3%, respectively.